Tyler Brown of Jay, Fla., receives the Farm Credit – Florida Peanut Producers Association Young Peanut Farmer Award during FPPA’s annual meeting, Feb. 22, 2018, in Marianna, Fla. Pictured left to right: Brown and Mike Digmon, regional lending manager of Farm Credit of Northwest Florida. The Florida Peanut Producers Association recently held their 43rd Annual Membership Meeting, Feb. 22, 2018, at the Jackson County Agricultural Complex, Marianna, Florida. Many farmers from across the state attended and heard presentations on association activities, a farm bill update and a peanut supply and demand update. 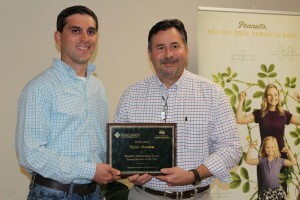 Mike Digmon, regional lending manager of Farm Credit of Northwest Florida presented the Young Peanut Farmer of the Year award to Tyler Brown, Jay, Florida. Brown started farm on his own in 2005, beginning with watermelons but moved to growing peanuts in 2012 on 70 acres and plans to expand in the future. He also maintains a small commercial herd of cattle. Brown has been working in peanuts all his life. He began working full-time in 2007 with a local peanut and cotton farmer where they farm more than 1,000 acres. Brown enjoys experiencing the crop progression, from planting a seed in May to the harvest in September. He has always wanted to be a farmer, even though people encouraged him to pursue other options. Growing up surrounded by agriculture in Santa Rosa County has given him a lifelong appreciation for farming. He is also dedicated to serving his community. Brown currently volunteers with the local FFA Alumni association and serves as captain for the Jay Volunteer Fire Department. In 2014-16, he participated in the Florida Farm Bureau Young Farmer and Rancher Leadership Team and has also participated in the EscaRosa Young Farmer and Rancher Leadership Team and served on the Farm Credit Nominating Committee. Brown says farming keeps him busy, but giving back to the community is important and has really helped him. Farming has changed dramatically since he started. Technology, in terms of seed and equipment has become more complicated. He says environmental concerns have greatly increased, and farmers are actively doing more with less. Brown says that tightening up pesticide and fertilization application rates have a positive impact for the environment and for the farmer’s bottom line. He is impressed by the accuracy of precision agriculture, and how the planting of peanuts has become more fine-tuned, and how swath control on sprayers saves money, time, and overspray. Brown has readily adopted best management practices (BMP) and has signed up through the Florida Department of Agriculture and Consumer Services BMP program. He has implemented research-based practices, including nighttime spraying, utilizing recommended varieties, and the Peanut Rx program for disease control. He scouts his own fields and makes decisions based on what he sees. “The most important thing you put in your field is your own shadow,” Brown says. With the ever-changing issues facing agriculture, Brown says taking advantage of every educational opportunity available is crucial. He attends meetings and conferences, reads trade articles, visits with other producers, and goes online to see the most updated information. This entry was posted in Florida News. Bookmark the permalink.